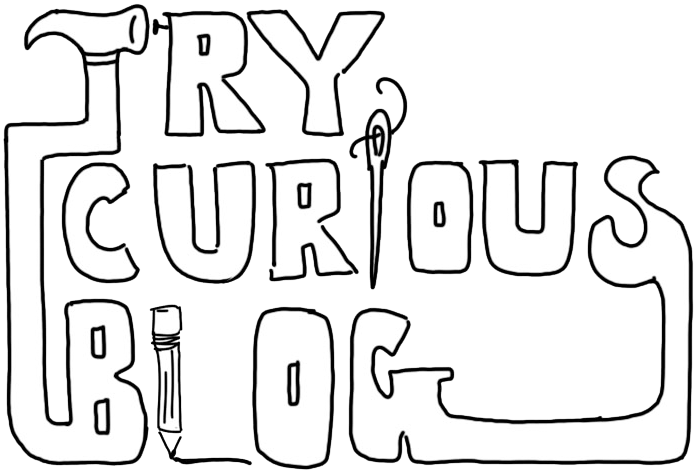 You are here: Home / Try Curious Blog / DIY / Quilting! Inspired by Quilting! 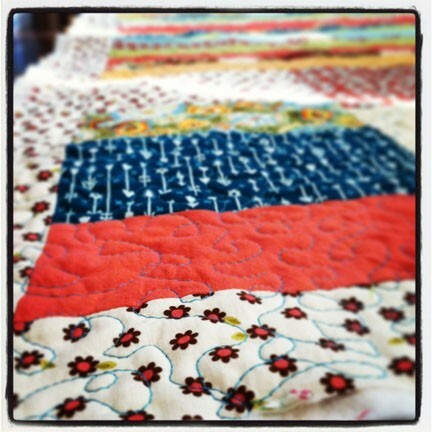 Like most of my creative endeavors, quilting is not something that I officially learned how to do. 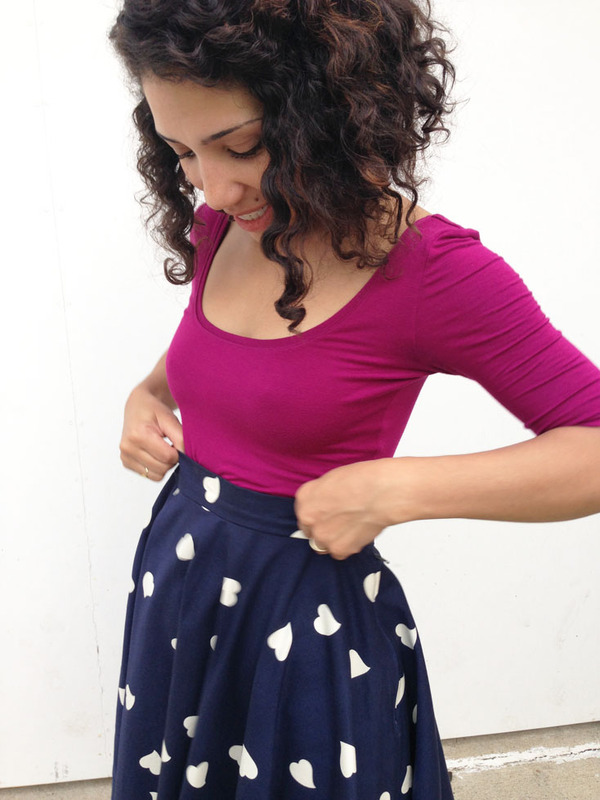 I was living in Vancouver and feeling miserable and bored because of the endless rain when somehow or another Claire and I stumbled upon a little fabric shop called Spool of Thread. It was bright and warm inside, the staff was friendly, and they had bolts and bolts of the cheeriest, prettiest fabric ever. At the time, the bulk of their fabric was quilting cotton (though I think they might have expanded their inventory to include more apparel fabric in the past few years) and just standing in the store felt inspiring. One of my co-stars and his wife were expecting their second child during our production, so I thought that this would be a good excuse to try my hand at quilt making. I looked online for patterns and found some remarkably cool projects, but they all seemed too complicated for what I was interested in doing. I appreciate ambitious designs, but I was more interested in the simpler quilts that had less pieces and less fussiness about them (or maybe I was just lazy and wasn’t interested in following those perplexing patterns). Whatever my reasoning, I figured that I only needed one important piece of information- what a quilt is made of. That was easy to figure out online: a quilt is one layer of batting sandwiched between two layers of fabric, with one of those fabric layers usually comprised of patch worked fabric. And the “quilting” action referred to sewing those three layers together, either by hand or by machine, using a variety of different methods and machine feet. 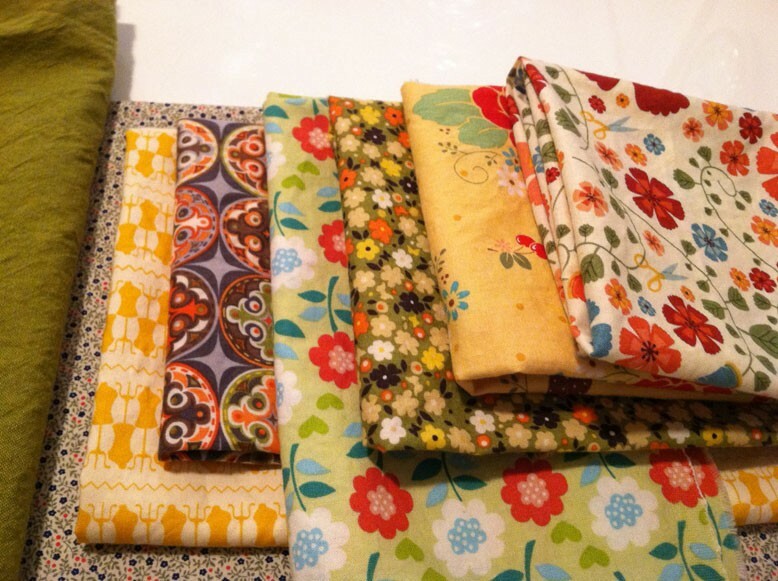 I headed back to Spool of Thread and bought small yardages of several floral prints, all in the same color family with a (surprise!) vintage aesthetic. 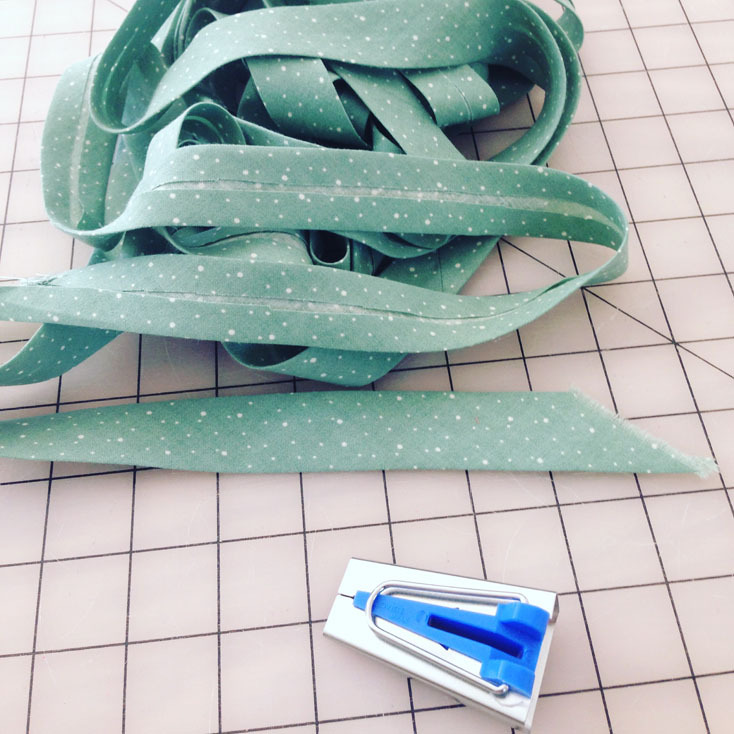 I also bought my first rotary cutter and a small self-healing cutting mat cut because I read somewhere that those were helpful items to have for a quilter. I laid out all my fabric on the dining room table of our rented house and just started cutting out large rectangles and squares of fabric. 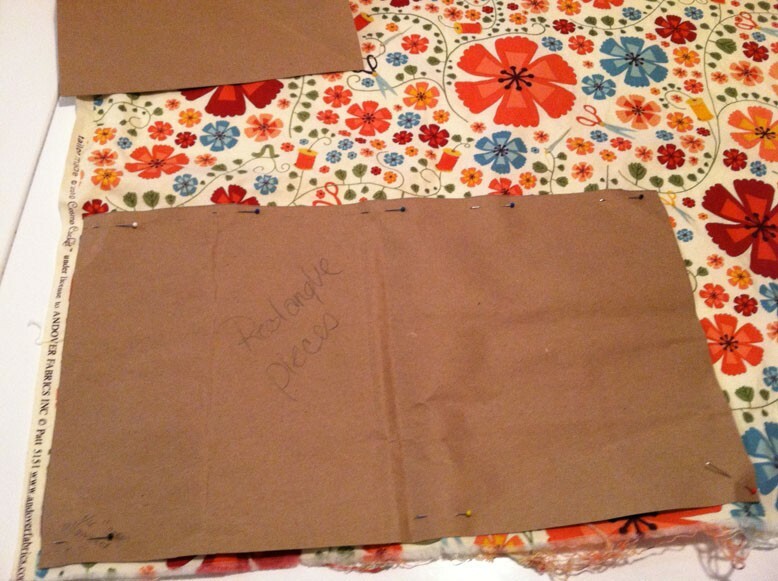 I had drawn a very basic template of the design for the fabric pieces, and when I was happy with it, I sewed it all together. Easy peasy! 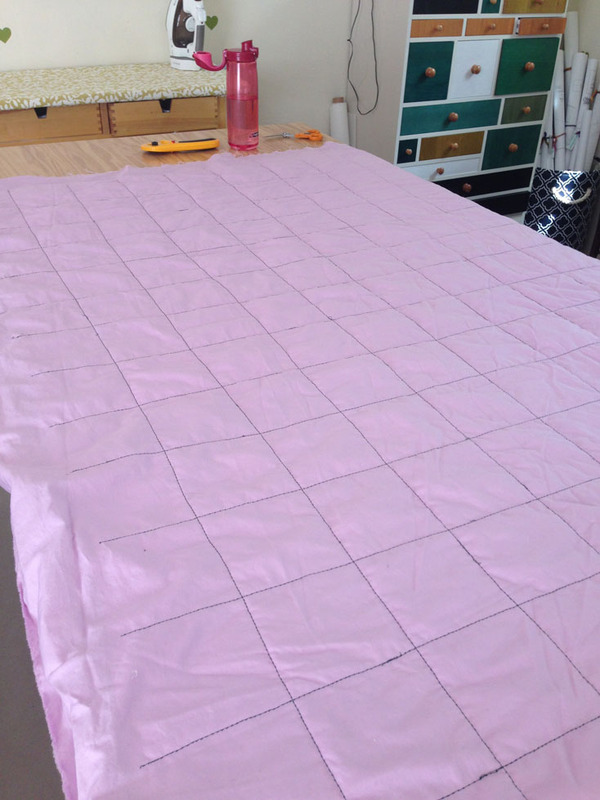 I was intrigued by the freehand sewing feet that some quilters used to achieve the pretty curvy flowy quilted look on their blankets, so I bought one and I LOVED IT! I was really sore after my stints of quilting with that foot because you have to grip the blanket with both hands firmly and guide it through the machine in whatever swirly pattern you are creating, but it was so worth it- the final look was so professional and the swirls I created looked just like my lines of drawing. The final step of my quilt making process involved sewing bias tape onto the edges, and I learned from the Colette sewing book that you could make your own bias tape with a special bias tape making tool and a little bit of regular fabric. 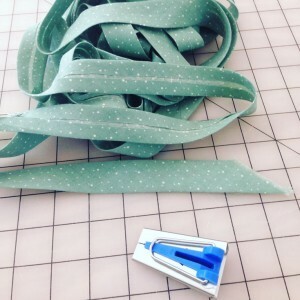 So I went out and bought it (this tool has become one of my absolute favorite sewing tools) and made yards and yards of my own bias tape, and then I sewed it onto the edges of the quilt. My bias tape application was REALLY raggedy at the time- I have since learned of a much cleaner, smoother way to sew bias tape which involves machine stitching it on one side and hand stitching it on the other- and I am not a perfectionist, so I don’t mind barely noticeable mistakes in my makes. 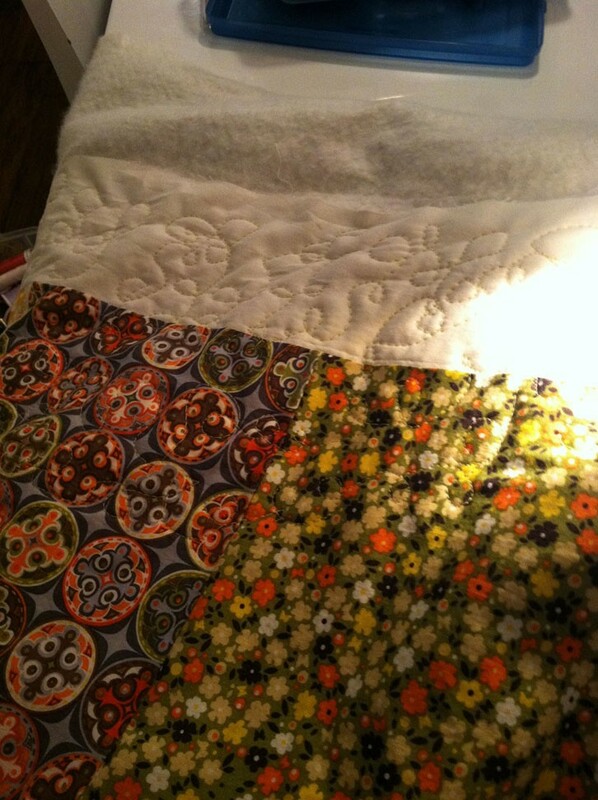 hand sewing bias tape to second side of quilt. 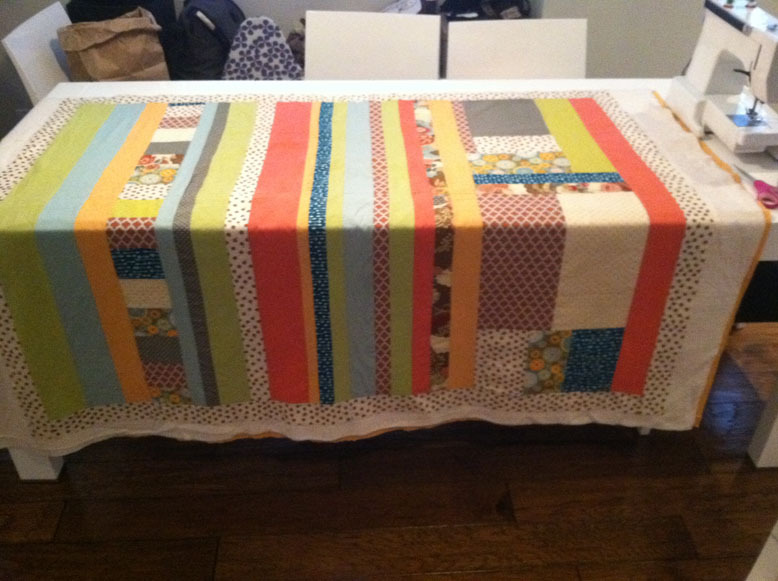 I was so amazed with the look of the final quilt that I wanted to keep it for myself (true sign of a great gift, no?) and my very next project was a quilt for us to keep. In the years since, I have made several quilts as gifts for our friends having babies, and the quality has gotten better with each one. 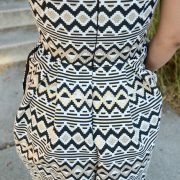 My designs have gotten more ambitious, too, although I still don’t follow patterns. I no longer draw out quilt designs beforehand, either- now I just choose arbitrary measurements for my squares/rectangles, cut out lots and lots of pieces in those sizes, and then start laying them out together in a pattern that looks good to me, adding more fabric if needed as I go. It probably takes longer than knowing exactly how many blocks I will need to cut from the beginning, but it also feels like an adventure, waiting to see how the piece will unfold as I add each piece of fabric. 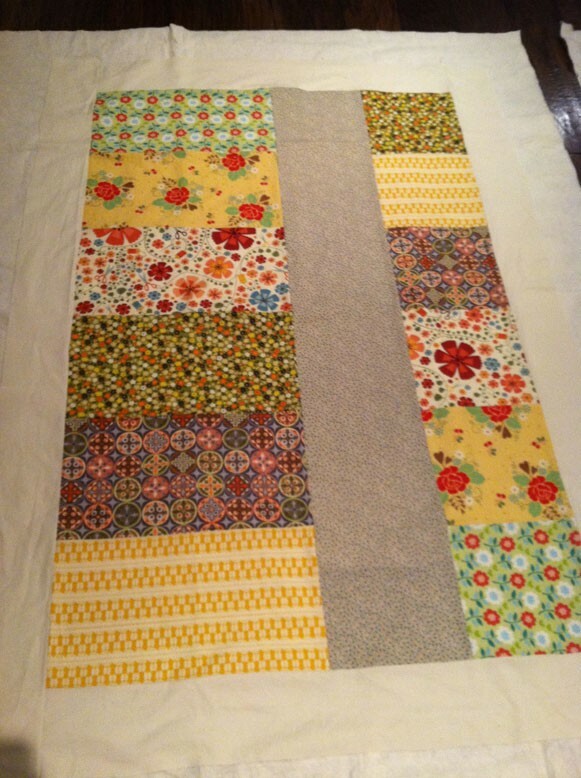 Looking back, there were definitely some weird choices I made in the construction of my first few quilts because I didn’t know any better, but none of them were “mistakes” per se; as long as your finished item functions as intended, there is no such thing as a mistake, right? 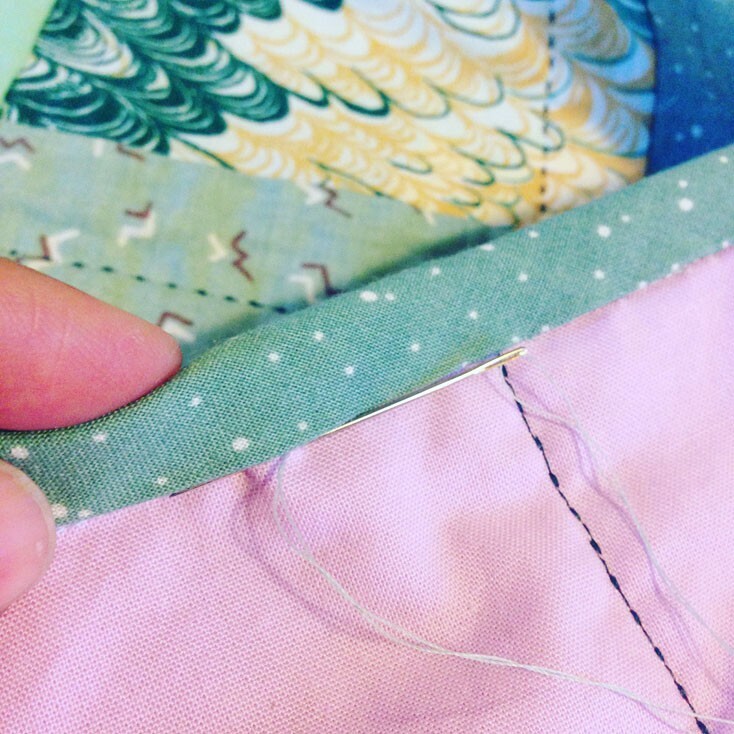 I have learned over the years to make smarter quilting decisions, like using 1/4″ seam allowance instead of 5/8″. 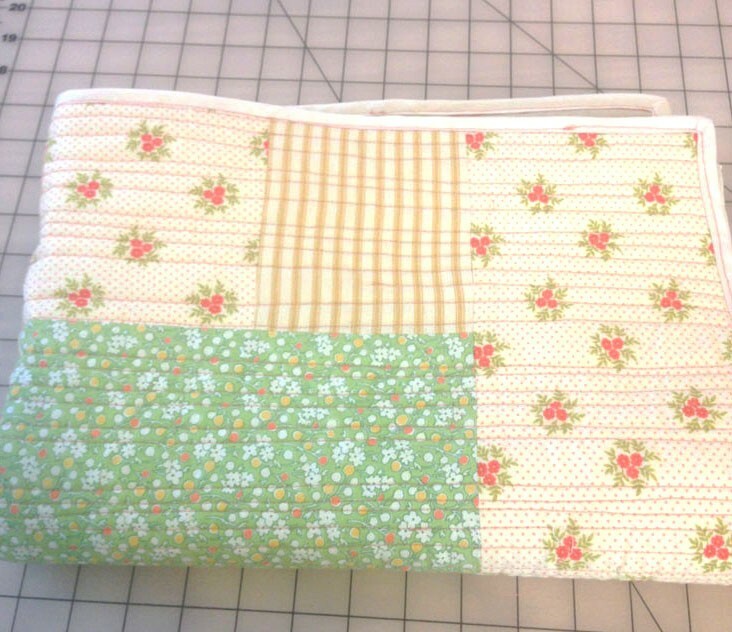 As mentioned, my bias tape application has evolved considerably, and I have also played around with my quilting technique; once I used a regular straight stitch to sew lines straight across a blanket in small increments, and it gave it this stiff, mat-like quality that I really liked. Most recently I used the “handquilt stitch” function on my Bernina to give my brother’s new baby’s quilt some old-school dimension, and it came out beautifully. To work that stitch you have to play around with the tension a bit so that the bobbin thread (which is the color that you will see on the blanket) comes through to the other side, but the clear thread that you thread through the machine is essentially invisible on the top of the quilt. It’s a little tricky because the tension has to be really tight which ends up breaking your thread a lot, so it’s time consuming, but it is still faster than free hand quilting and certainly requires a lot less muscle. When I first learned to sew I always thought that quilting was a boring project to take on- you don’t get to wear it, and there didn’t seem to be a lot of creativity involved in it. This, like so many thoughts I had in my twenties, turned out to be wrong wrong wrong. 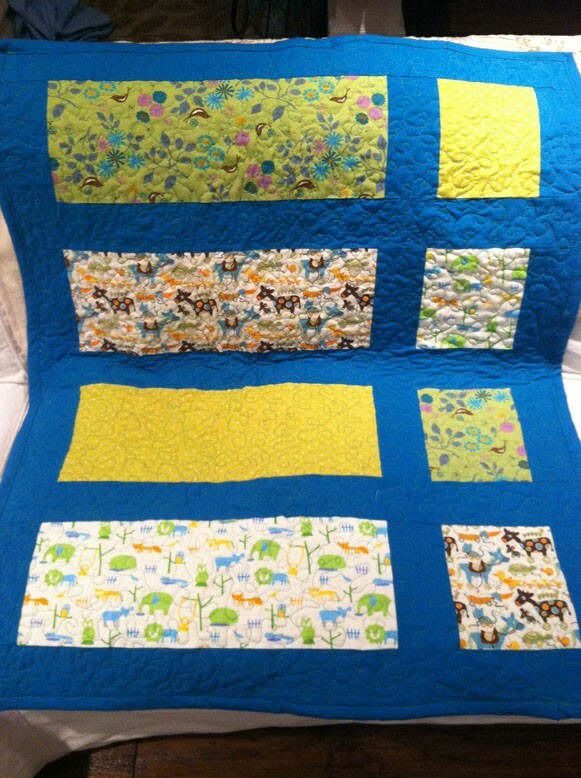 Making quilts for people has been one of the most satisfying gifts to create because I know that it will never go out of style, and if I have designed it nicely enough, it will stay with the baby for always. A couple of times I have made baby blankets with juvenile fabrics, which came out really sweet (because who doesn’t love those light pastels?!) 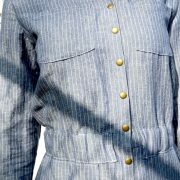 but now I try to use more mature fabrics in the hopes that they will be designs the baby can grow up with. 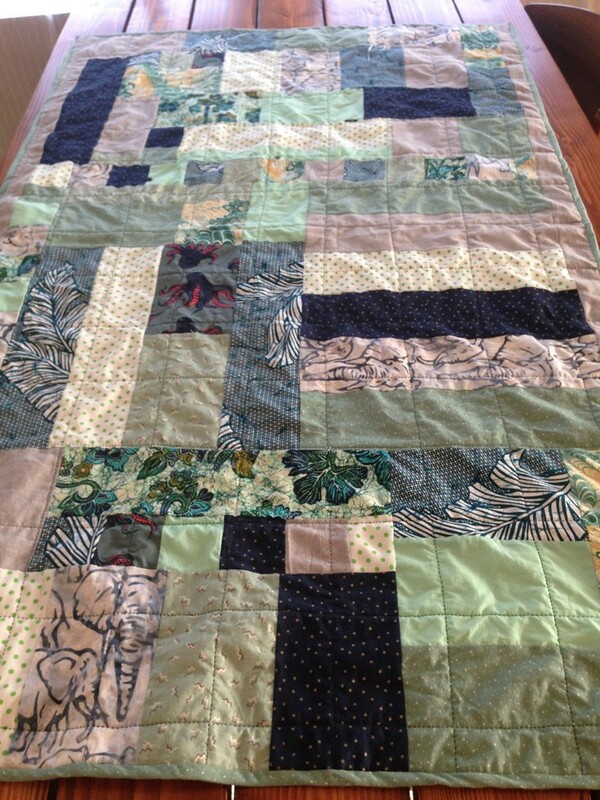 I got really lucky with my most recent quilt I made for my brother’s baby. Claire and I stumbled upon an estate sale two blocks away from my house, and the occupant of the home had been an avid quilter with boxes and boxes of folded quilting cotton in one of her spare bedrooms. The sign said “$5 for whatever fabric you can fit in a plastic bag” so Claire and I went to town, choosing anything that fit in with a green and blue theme. 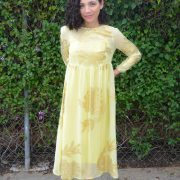 When I got home I added pieces from my own stash to the mix, trying to choose fabric that had been used in some of the clothing I had made in the past. 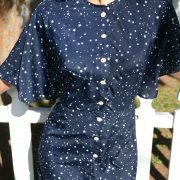 I’ve got the button down shirt I made for my brother Nick in there, the octopus fabric I used from Claire’s favorite button down, and the ladybug cotton I used for a vintage dress I made for myself a few months ago. 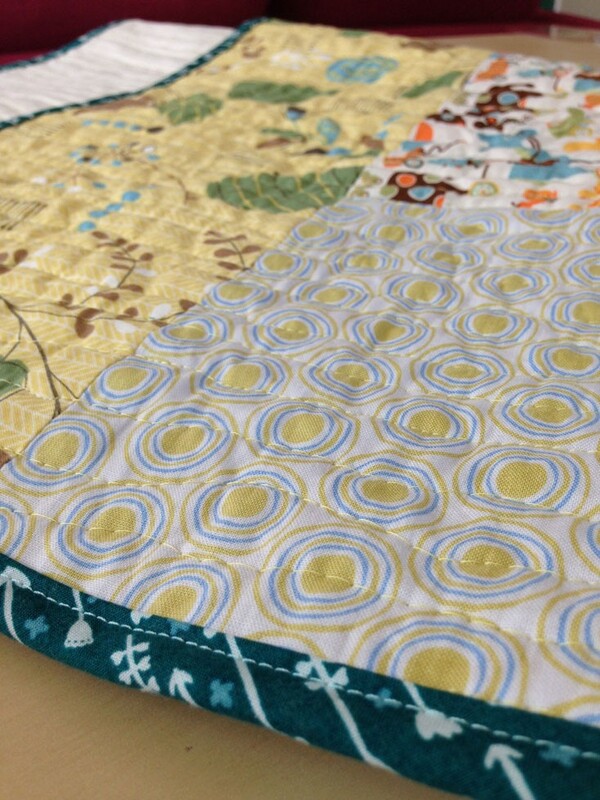 Sometimes when I am in a sewing rut and I don’t feel inspired to make anything on my To-Do list, quilting is the best remedy. 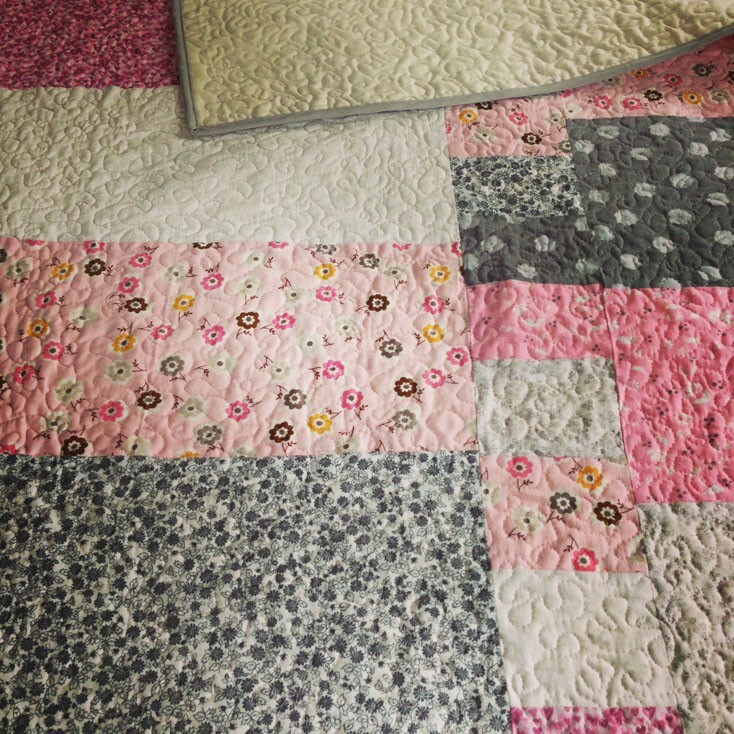 It allows me to be creative without having to engage any complicated techniques, and there is something really straightforward and therapeutic about the process, especially when it comes to the actual quilting. 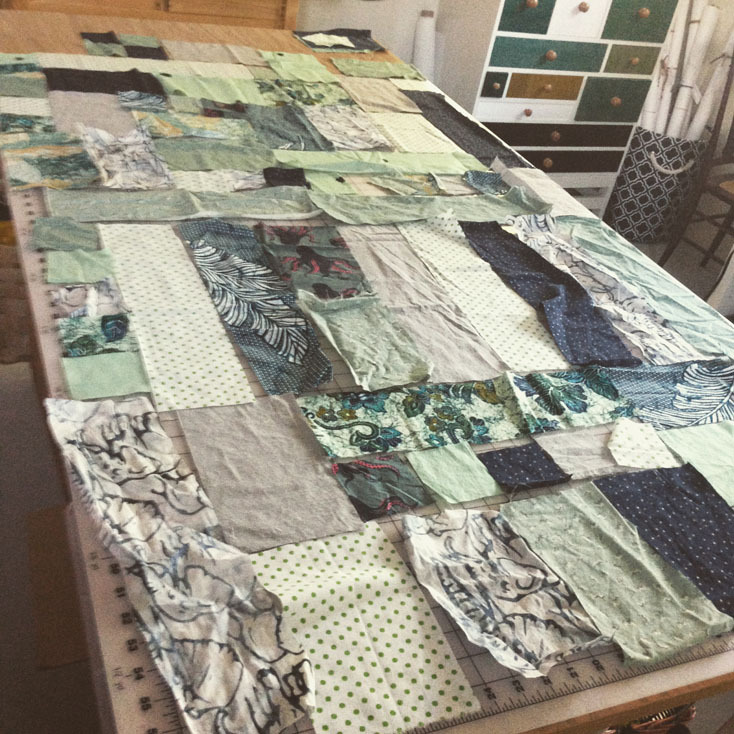 A quilt, from start to finish, takes a little bit of time depending on the size of your project, but by the time I am finished with one I usually feel rejuvenated and ready to tackle more advanced stuff. Ultimately, my favorite thing about making a quilt as a gift is how much I think about the recipient through every step of the process. I think about fun memories of my time with the parents and about what wonderful families they will make; I think about what the baby will look like, and I imagine them at different stages of their life with their blanket in tow. 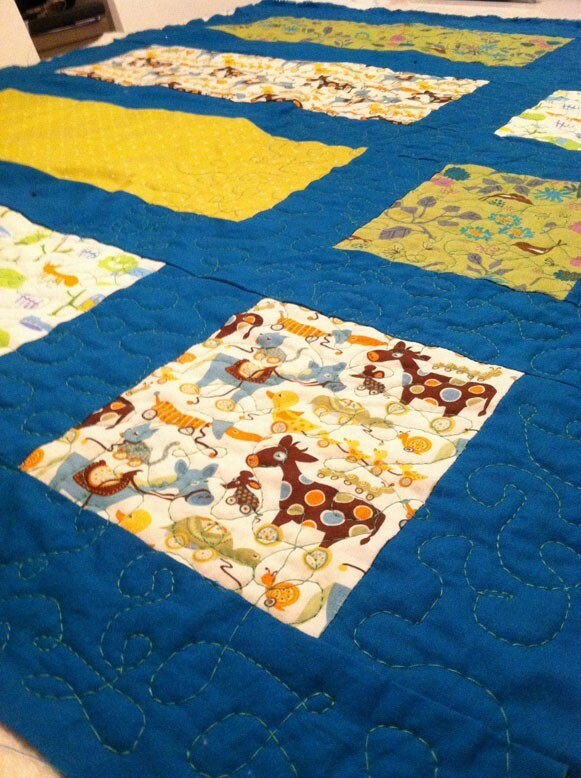 What if these quilts survived long enough to make it to the baby’s adulthood? What if they were displayed like wall hangings in their first apartments, or better yet, folded up into the crib’s of their own babies in a few decades? AHHH, THE POSSIBILITIES!!! 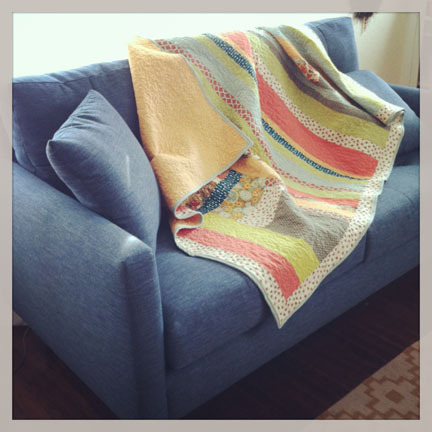 http://jasikanicole.com/wordpress/wp-content/uploads/2015/09/Levi_folded-quilt.jpg 682 682 Jasika Nicole http://jasikanicole.com/wordpress/wp-content/uploads/2013/08/logo_green-300x78.jpg Jasika Nicole2015-09-19 16:09:432015-12-30 10:28:39Quilting! Inspired by Quilting! Beautiful quilts and love your relaxed process of quilting. You have inspired me to pullout all the quilting paraphernalia that I have acquired over thr years, but too intimated by all the fancy quilt patterns online. Great job! What machine do you use?I’ll understand if you don’t wish to mention it but I’m a newbie quilter who has been told that a good machine is essential. 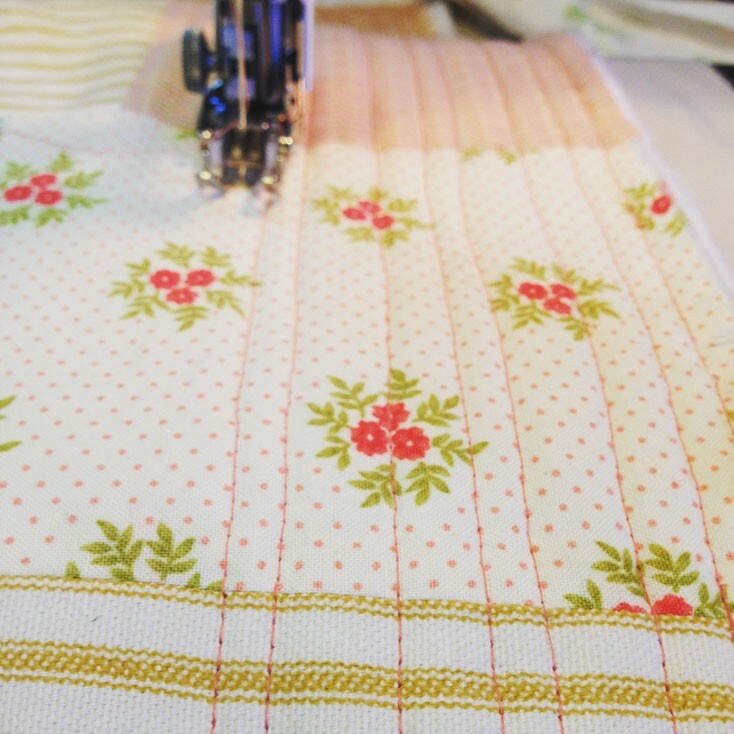 I probably have a different perspective than a lot of other quilters and sewists out there, but I think the phrase “a good machine is essential” sounds a little daunting, and in my experience, quilting isn’t that finicky. 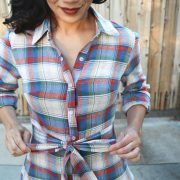 It’s true, you do want a machine that operates efficiently, but the most important functions it needs to have are sewing straight lines and being able to sew over three layers of light-to-medium weight fabric. The projects I have worked on that required an exceptionally well operating sewing machine have never been quilts; my jeans needed a machine that could tackle very thick layers, and I have worked on some upholstery and leather projects that also required a machine that could handle heavy-duty sewing. But quilting? I have been able to do that on my least impressive machines with no problem. 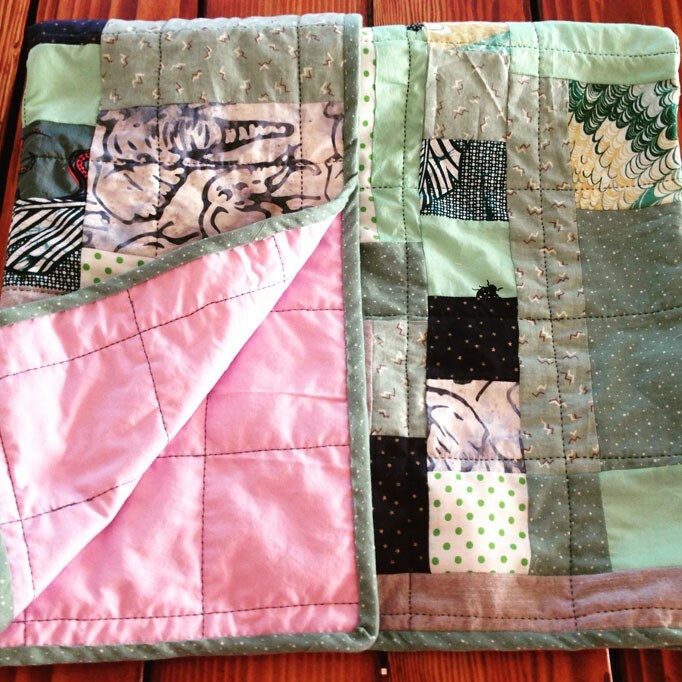 I have made quilts with both a freehand quilting foot, which requires quite a bit of hand eye/ coordination and upper body strength to push and pull your quilt through to make those pretty loops, and I have made quilts with a walking foot. 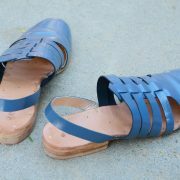 I would suggest that a newbie use a walking foot to start, because it allows you to go slowly and carefully and it makes sure that all your layers of fabric get pushed through the feed dogs at the same time, so there is no skipping of stitches or buckling of fabric. I have made all my quilts on three machines that are currently or were once in my posession: a Bernina 350, a vintage Singer (totally forgot the model but it’s from the 1950’s and it only sews straight stitches), and a Euro-Pro Denim “Sew-lution”. I also have a 14 year old inexpensive Brother machine that has hardly any bells and whistles, and although I haven’t needed to use it, I feel confident that it could handle quilt-making with ease. I hope this helps! And good luck!